These days just about every event is deserving of a special version ?this? or a limited edition ?that? in some marketing departments eyes. One company that seems to resist this more than any other, presumably because of its size and the sheer logistical nightmare it would create, is Shimano. Theo Boss? white and silver R300 shoes. 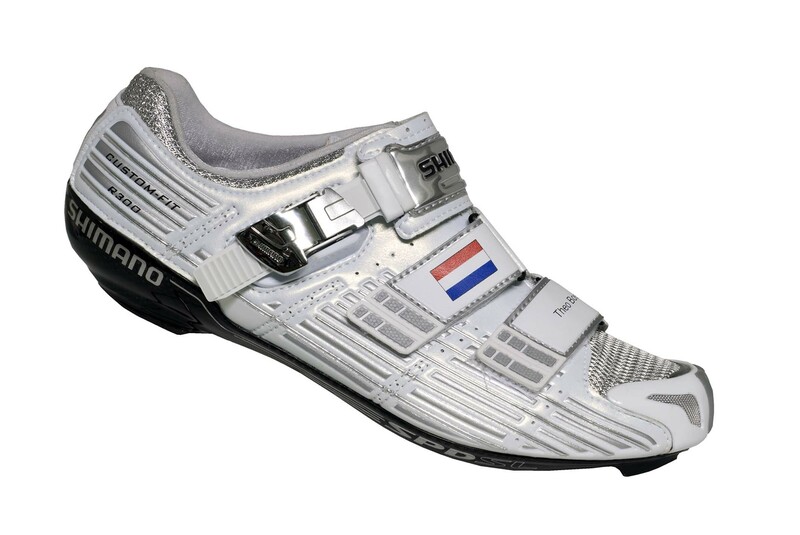 Well it seems that the Olympics is just too big for even Shimano to ignore, enter the limited edition white R300 shoe. Featuring all the usual tech innovations each of Shimano’s sponsored riders will receive a pair in this special edition white and silver, branded with their home nations flag and their name inscribed across the front. This pair is from the Netherlands track legend Theo Boss. Perhaps with team GB riding so well Shimano weren?t confident of Theo getting Gold so opted for the relatively safe silver option.